We have now completed our main works to improve the drainage on Beckspool Road and Riverwood Road, Frenchay. As part of our commitment to improving drainage facilities in Frenchay, we have agreed to upgrade and enhance the village pond on Beckspool Road. As well as desilting the pond, work will include the installation of a new gulley and new catchpits to filter debris and prevent it from entering the pond in future. These works are scheduled to begin at 10am on Monday 11 February 2019 for 3 weeks. To ensure we can carry out these works, and for the safety of both the public and our workers, the section of Beckspool Road adjacent to the pond will be closed for the duration of these works. Access for residents and businesses will be maintained and a signed diversion route will be in place. We apologise for the inconvenience this closure will cause and would like to reassure you that we will do everything we can to minimise the impact of the works. Beckspool Road was selected as one of nine sites across South Gloucestershire as part of a wider £3.35million Government funded scheme to improve drainage and flood protection systems. The road did flood on a regular basis causing traffic disruption, damage to properties and to the highway. We carried out comprehensive survey work which showed there are numerous defects with the existing drainage system. Repairs included replacing and/or upgrading defective pipes, removing root ingress from trees and replacing defective manholes and gully covers. We also reroutined the existing drainage system which required extensive digging and relaying of the kerb line in Riverwood Road. Bus services may be affected by these roadworks and more information will be made available shortly. We will do everything we can to minimise the impact on bus passengers and apologise for the inconvenience caused. If you would like to be sent a copy of the revised timetable please email public.transport@southglos.gov.uk or call 01454 868004 to register your contact details with the Public Transport Team. 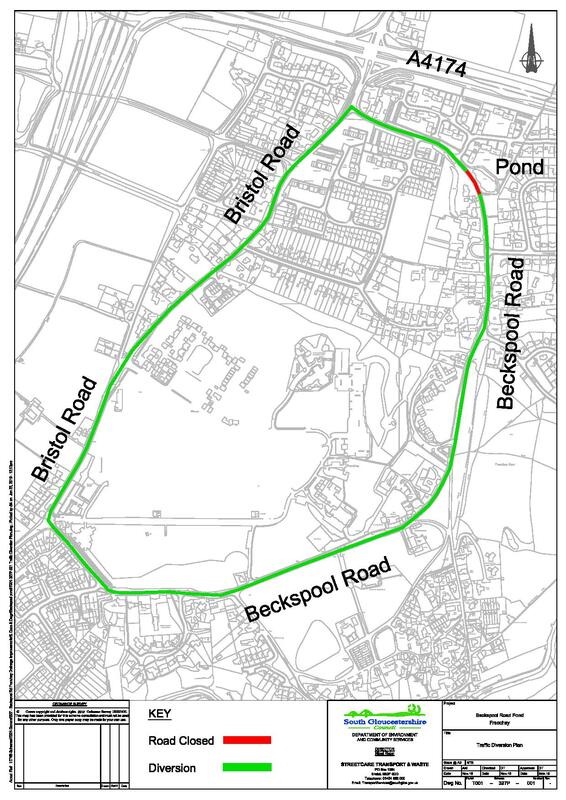 We realise that implementing traffic restrictions on Beckspool Road for a sustained period of time will have a significant impact on the local community and road users. We apologise for the disruption these essential works will cause.